If you've found any of the software on this site useful or you've benefitted directly from it's use please consider donating to Cancer Research UK or the British Red Cross. Alternatively use the Donate Button below and I'll pass it on to these organisations. Please let me know if you make a donation directly. The following is a list of questions commonly asked about the swingbench benchmarking environment. Can I get support for swingbench? How do I report a bug for Swingbench/TraceAnalyzer/DataGenerator? Can I raise SRs against swingbench? Can I get hold of the source code for swingbench? Can swingbench be used to benchmark hardware? Can I change the transactions used by swingbench or include by own. Why hasn't there been a new release lately? I'm struggling to get swingbench to work with 64bit OCI libraries I get " ELFCLASS64 (Possible cause: architecture word width mismatch)"
What versions of jdbc do you use? How does cpumonitor work in 2.4/2.5/2.6? What does the transaction load ratio mean? What is the maximum CPU load I should run a load generator at? Whats the best version of swingbench to run my tests with? How many load generators (servers) will it take to fully load a database server with? I keep geeting a java exception "java.lang.NoSuchMethodError: oracle.jdbc.pool.OracleDataSource". What am I doing wrong. Can I run mulitiple load generators against a single database instance? Which JVM should I use? How do I get CPU monitoring working? Why don't I see CPU and disk statistics inside of swingbench when running on the Windows platform? I don't get any charts, other than user count, inside of clusteroverview, what have I broken? Can I set various connection properties i.e. 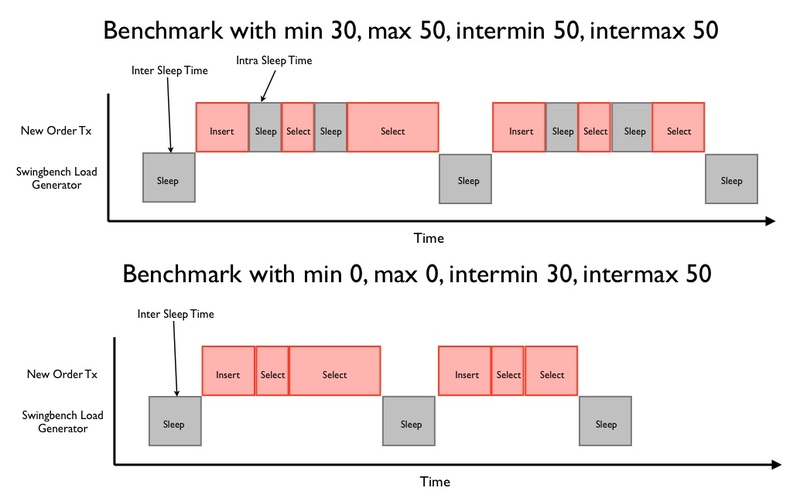 "Statement Caching"
Whats the difference between "inter" and "intra" sleep times in swingbench? How can I tell if the benchmark has installed correctly? The benchmark isn't running as quickly as I thought it would. Why do I need to keep generating new sets of data for each Callingcircle benchmark run? How many transactions do I need to generate for a Callingcirle benchmark run? Why are there two versions of the Order Entry benchmark, client side and server side? Order Entry dosen't appear to scale as well as Callingcircle, why? Whats the difference between the Callingcircle benchmark and Order Entry benchmark? Is there a datawarehousing benchmark available? At this point in time I’d recommend using Swingbench 2.6. It features Oracle Database 12c Release 2 and Oracle Database 18c support. Please use this version and let me know if you have any issues. Yes. It comes as seen, there are no licenses or support charges. If you find it useful let us know. No. There is no support mechanism for swingbench, it is not an official Oracle product (hence the reason for it being on my personal website). I'll fix obvious bugs but sadly my full time job does not allow me to provide advice on training or how to configure swingbench. I have started improving the documentation and rounding off some of the rough edges which should help. No. As I indicated above there is no official support channel for Swingbench. If its something you simply can't figure out leave me a message on comments page and I'll get back to you as soon as I can. If there is enough interest I'll put together a forum or bug repository. No. Im not in a position to distribute the Swingbench kernel however I do distribute all of the source code for the transactions which can be viewed and modified. This is still my intellectual property and shouldn't be used with anything other than the Swingbench framework. Whilst this is one of the main uses of Swingbench it has to be stated that because it is an unofficial product the author or Oracle Corporation will not offer an guarantees on the validity of the results. It should primarily be used as a guide line. This is not the aim of Swingbench. It is designed as a support/demo tool of Oracle technology. We have no plans to extend its functionality to run against non Oracle databases. Currently it supports Oracle and TimesTen only. I try and update my thoughts on the development of swingbench and any minor changes I make inside of my blog which you can find it here. Yes. The source code for all of the transactions is included in the distribution. It can be found under the $SWINGHOME/source directory. An "ant" script is also shipped that easily compiles all of the source code for you. It is also possible to modify some simple PL/SQL packages to include your own code. This screen cast describes all of the ways possible to modify swingbench. Developing swingbench is not my full time (or even part time) job. It is done to support projects inside of Oracle. Also make sure you are pointing to the right version of the jdbcoci libraries. This is caused by a variety of reasons. It might be caused because statistics are being collected over a long period of time. The amount of memory allocated to swingbench can be changed by editing the files responsible for launching the code. In Swingbench version 2.4/2.5/2.6 You need to edit the launcher file. This file is located in the "launcher" directory and is called "launcher.xml". Simply edit the file and change the values to reflect your required memory requirements. You only need to change the section titled jvmargset i.e. This example uses oewizard to create a schema "soe1" in a tablespace soescale1 using 16 threads to build it. It then runs 3 workloads against the schema increasing the user count for each run. It then builds a bigger schema (scale 10 = 32GB of space) and reruns the test. The load ratio is the ratio in comparison to other transactions. ie. Load ratios allow more precise control of the transactions. You change the ratios by modify the values within the config file or by changing them with the swingbench UI as shown below. It Depends. Typically it is a ratio of one load generator CPU to two database CPU's That is to say it would take a 2 CPU machine to fully load a 4 CPU machine. This assumption is based on the CPU’s/Cores being of equal processing power and the load being run with zero think time. It is usually the case that you will need as least 2-4 users/threads per CPU/Core. Swingbench, minibench and charbench are simply frontends on the swingbench kernel. Swingbench is a rich fully functional frontend that includes several real time charts and as a result has a significant cpu cost associated with it. Minibench is a simple graphical tool without the overhead of Swingbench but is useful for users who like to be able to see what is happening in an organised and controlled fashion. Charbench is a character front end that enables the load generator to be be run where it is not possible/sensible to use a graphical front end. All three of the front ends have the same functionality and are interchangeable with one another. Swingbench require's the latest versions of jdbc to work properly. Download the 12c jdbc drivers from Oracle and use these even when running against older versions of the database database. Yes. In fact it is advisable when running a large load against a database to use multiple copies of swingbench. These can be coordinated using clusteroverview. Yes it can be found here. To configure it simply go to the Distributed Controls tab and enter the hostname of a server you wish to monitor. The username and password should be of a user who can run vmstat. You can test the connection with the button to highlight any security issues. This usually occurs because the the "DisplayName" in clusteroverview.xml is different to the connect string being used by a load generator. Presently if you wish to measure the scalability of a cluster the DisplayName attribute must match one or more load generators connect strings. i.e if you have a load generator(s) with a connect string of //node1:1521/soeservice the DisplayName must be //node1:1521/soeservice. 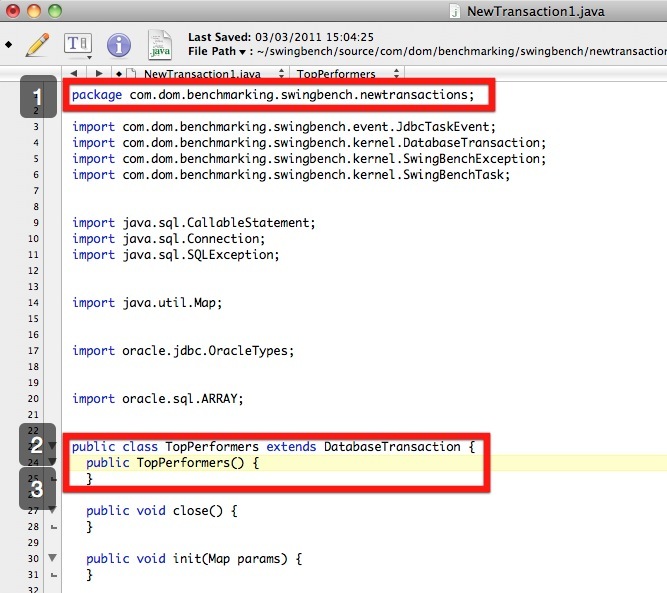 Whilst this isn't the place to show you how to develop swingbench transactions in java I can show you basic steps to modify or rename the supplied benchmark transactions. You might want to do this if you wanted to develop your own code, add more transactions or simply call them something else. The first change reflects the new package name. The second and reflects the new name of the transaction you are creating. 7/ repeat step 5 and 6 for all of the transactions you wish to create. You might at this stage also modify the code to reflect any other functionality changes you want to make. 9/ run ant to compile the code (it will use the build.xml file in the source directory). You'll need to make sure that java is in your path etc. Whilst Oracle deals very well with large numbers of users logging on at the same time some approaches, such as connection pooling, depend on the gradual logging on of users to work efficiently. Swingbench mimics this effect by logging users on in batches and enabling to begin their transactions as soon as they've logged on. To define your log on profile you'll need to enter values in the "Load" section. In the example below we've asked swingbench to log users on in batches of 10 every second and by specifying "Wait Till All Session Log On" to false swingbench will allow the session to begin running their transactions as soon as they've successfully connected. This means that for the example below it will take 50 seconds to load all of the users on and transactions will begin immediately. The profile you use will depend entirely on the number of sessions to be logged on and the processing they will do when logged on. Most systems don't logon 10,000 sessions straight onto their server first thing in the morning. It is likely to be a steady increase over a period of time. Logging users on whilst transactions are being processed is a good test of the network and power of your server. Yes. From Swingbench 2.5 you can set connection properties via a set of drop down lists in the connection properties dialogue. The following table describe valid connection properties. As the name implies intra sleep times occur “inside” of a transaction. Inter sleep times occur between transactions. 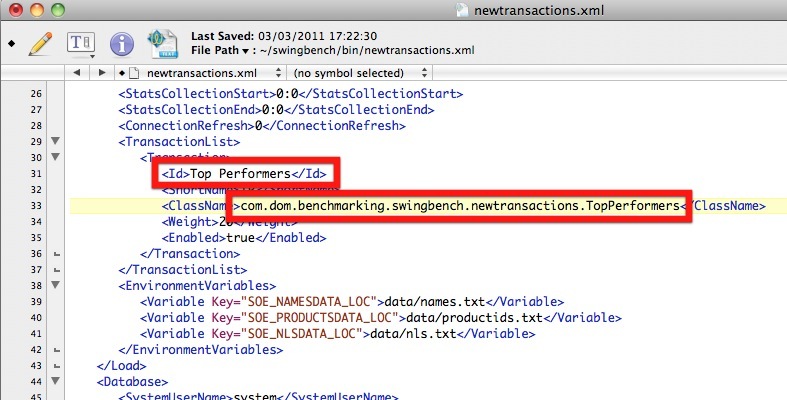 Many of the transactions inside of the swingbench “SOE” have sleep times between DML operations (select, insert, update). In some situations this better emulates what happens in some legacy form based systems, this is what is controlled by intra sleep times. However most systems these days tend to utilise web based front ends where DML operations tend to be fired as a single operation when the user submits a form. This approach results in a more scalable architecture with fewer locks being held and for shorter periods of time. Hopefully the following diagram will explain the differences in a clearer fashion. In 2.4/2.5/2,6 of swingbench the wizard will check whether the schema has the right number of tables/indexes/procedures etc. At the end of the install it will display a small report providing details of the run time and a list of invalid and valid objects (see below). All of the objects that have been created should be valid. replacing the username, password and connect string with your own. 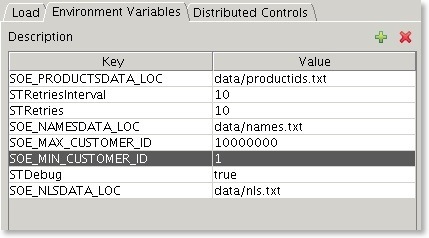 You will need to specify either -soe, -sh or -tpcds to indicate which benchmark schema you are working with. This may be perfectly normal. They may occur if the scripts attempt to drop objects that don't exist. Check their context and the final report to see if all of the objects are valid. You should have the following tables and and index count. You can check this the sbutil command. Ignore the row counts these will depend on the size of the benchmark you selected. This is probably because you either ran out of space or you didn't size your TEMP correctly. As a guide line for a schema of size “x” you'll need at least “x/6” worth of temp space i.e. 1TB schema needs about 180GB of temp. You can resize it after the build to what ever you decide is appropriate. That's not unexpected. Some features of the benchmarks are designed to introduce a degree of contention to determine how well the underlying hardware handles it. It is unlikely you will be able to get the CPU to run at 100% especially as you increase the size of the schema. Use the AWR reports to determine what the issue is. Swingbench 2.3 enables you to take database snapshots at the start and end to determine the cause of wait event. You can enable this using the relevant fields within swingbench (shown in the image below). This will take a database snap at the start and end of the benchmark. Get your friendly tuning guru to take a look and make some recommendations. I also put the top ten wait events and their percentages into the output report (output tab in swingbench, results.xml in minibench and charbench) if the "Collect database statistics" option is checked. They should look something like this. NOTE : The Calling benchmark is deprecated. Modern CPU’s simply burn through the transactions too quickly and. I’ll keep it round for backwards compatibility but I won’t actively test or maintain it. Callingcircle transactions are based on "customers" that need to be processed or have their details updated. The generation process looks for likely candidates and writes them to files. Each benchmark run updates customer details and so new candidates need to be found. Eventually a significant proportion of available customers have had their details updated and so the entire benchmark needs to be updated. It is also important that if you are using multiple load generators each has its own set of generated data. It depends. The more powerful the machine/cluster the faster the transactions will be processed. A thousand transactions lasts only three minutes on a Xeon processor. Therefore to generate a 30 minute load you'd need at least 10,000 transactions and probably 40,000 transactions for a 4 CPU machine. Update : I've been informed of an issue where its not possible to hold all of the transactions in memory for a long sustained run on a powerful machine. Im working on a solution to enable a disk based loading mechanism. One uses PL/SQL stored procedures to generate a load and the other uses discrete java routines and individual jdbc statements, as a result the later will generate a lot of network traffic. We would recommend the use of the PL/SQL version of the benchmark. Order Entry updates a relatively small table containing stock levels at each warehouse. This creates a great deal of contention and limits it scalability. Order entry models the classic order entry stress test. It has a similar profile to the TPC-C benchmark. This version models a online order entry system with users being required to log-on before purchasing goods. The Calling Circle benchmark represents a self-service OLTP application. The application models the customers of a telecommunications company registering, updating and inquiring on a calling circle of their most frequently called numbers in order to receive discounted call pricing. It is characterised by large amounts of dynamic PL/SQL and is CPU intensive. Calling Circle also requires the regeneration of data after each run. I've included three additional transactions in the orderentry benchmark to enable users to increase the "Read" workload for the Oracle database. The transactions are disabled by default and so won't effect any historical comparisons. To enable them for a benchmark run simply check the box on the right hand side of the table. 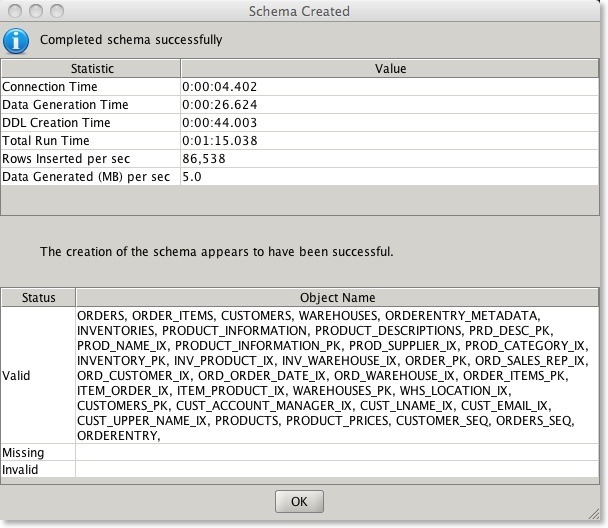 In swingbench 2.3,2.4 and 2.5 there is a new wizard "shwizard" that builds a sales history schema. It is currently under test but it can be used to build a sizeable test database. Swingbench also includes a config (shconfig under the $SWINGHOME/configs directory) with and a number of queries to stress the resultant schema. Swinbench 2.6 also ships with a TPC-DS like benchmark. Let me know if its of any use via the comments page.